There's nothing quite like the smell and the sight of a beautiful floral arrangement made of fresh cut flowers every day. Floral Displays are an understated splendor that shows off your bouquets without taking anything away from them. Whether you are looking for new devices to display fresh cut blooms or greenery for your store, for special events and occasion, or just for your own viewing pleasure; simply check what All Store Display has to offer. Design an array of full colors by including our various types and sizes of metal shiny buckets, a tricycle shaped planter or add blooming buds in vintage decanter bottles along with a little accent lighting that can be used in a variety of other ways. 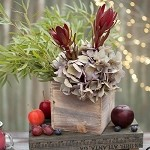 These among many other planters and vases are ideal for sprucing up weddings, buffet tables, and more. Add a visual design that your customers will least forget that's full of life and stays alive long enough for you to enjoy. From rustic to modern appeal, we have it all, come see for yourself. Decorating comes natural to most but working with flowers, shrubs and greenery are fun for everyone of all ages. Offering a wide selection of floral presentation devices like we do here at All Store Displays gives your creative thinkers and shoppers choices. Provide them with the tools they need to complete their beautifying task when they are working with botanical gardens. Generate a show stopping exhibit for your customers to enjoy and gain the attention that your store deserves. Utilize a variety of our display tables as you see fit in your event, home or office. Come and check out our selection of flower display containers today!